I have just solved the Mystery of the Thirty Nine Steps – in Venice. Nothing to do with John Buchan’s novel, of course. But everything to do with the best-situated luxury hotel in the world’s most beautiful city. Now, every traveller knows that there is far, far more to Venice than St Mark’s Square. But the traveller also knows that “the finest drawing room in Europe” (N. Bonaparte Esq) is the magnetic hub of this magical town. No matter how far your sightseeing footsteps might take you, you will always be drawn back to the colonnades, the campanile and the front of the Basilica. Even on a winter’s night, when you will be (almost) alone, the sense of being at the heart of the city is overwhelming. And 39 steps from the south-west corner of the Square (yes, I did pace them out) is the Luna Baglioni Hotel. 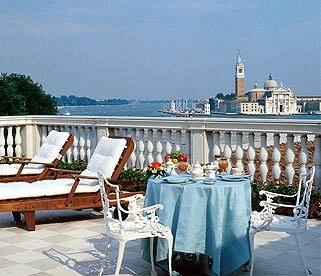 The Luna claims to be the oldest hotel in Venice – hardly a surprise, given the wonderful location. There was an inn on this site 900 years ago. The hostelry in which I stayed is rather more recent in its construction, although it can still boast some rooms of historical importance. Indeed, one thing you must NOT do if you are staying at the Luna is to breakfast in your room. If you do, you will miss what must be the most exquisite hotel breakfast room in Europe. Above my head in the Marco Polo Room, as I tucked into some tasty bacon from the buffet, was an 18th century frescoed ceiling (School of Tiepolo) of rare beauty. I could happily have stayed all day, gazing at the scantily dressed lads and lasses disporting themselves in the clouds. First impressions on arriving at the Luna are good. Much money has been spent on marble, gilt and Murano crystal and the resulting public spaces impart an admirable feeling of luxury. And General Manager Stefano Bàccara has a staff which knows how to be both welcoming and efficient. I liked the grand staircase and the lofty hallway. If you can arrange to meet a friend in the latter and arrive by sweeping down the former, I fancy your self-esteem will be in good order for a month. Upstairs, on the second floor, room 215 was classified as ‘deluxe’, and the appellation was appropriate. Walls covered with white silk damask, swagged and tailed curtains in the same silk, lacquered wooden doors, thick red carpet, a marble-topped occasional table and a flamboyantly carved headboard for the beds in gilt wood – this was comfort very much in the Venetian style. Two wall lights and two table lamps provided restful lighting. In the pink marble bathroom were two wash basins and a tub both long and deep. (This latter had nozzles – to do with agitating the water, I think – but they were so cleverly placed that they impinged upon me not at all.) I was impressed by the shaving mirror – positioned, for once, so that it could actually be used – and by the provision of thoughtful items, like a safe (hidden away in the wardrobes in the hall) and that tiny but too often neglected essential, a shoe horn. Only two objects were missing from the bedroom: a mirror and a clock. There are rooms at the Luna which possess views, but this was not one of them. Nevertheless, plenty of daylight poured in through the net curtains, so the atmosphere during the sunshine hours remained bright and airy. I judged £300 to £500 (according to season) a night for two, including breakfast, good value for this spacious and well-equipped accommodation. 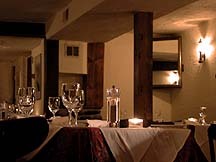 Dining here is done in the Canova Restaurant – a long, low, L-shaped room, next to the main entrance. The lace at the windows, the stretches of wooden panelling and the crystal chandeliers contrast with the canned jazz music and the waiters dressed entirely in black. It sounds rather odd, but it works well – because the music is soft and the waiters, marshalled by the admirable maitre d’ Giovanni Bozzelli, are friendly and discreet. My opening lobster salad, with french beans and tomatoes, was exceptionally well done – the lobster both tender and sweet and the plate prettily presented. Gnocchi with tomato and basil was straightforward and decent. A chateaubriand might have had a better béarnaise sauce, but the pink beef fillet was full of taste. Pancakes with orange sauce and vanilla ice cream ended this enjoyable meal from chef Giampaolo Cosimo’s kitchen (£50). 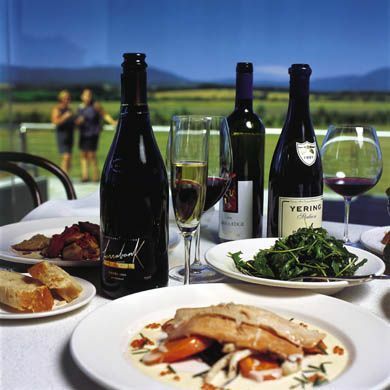 Of the 75 wines on the list, the vast majority is Italian – running in price from a 2000 Soave Classico at £14 to a 1996 Brunello di Montalcino (Casanova di Neri) at £115. My white was a blend of chardonnay and grechetto from Umbria – creamy, full-bodied and nutty (Cervaro della Sala, 2000, Antinori - £39); and my red was a local blend of 70% merlot and 30% cabernet – medium-bodied, oozing cassis and full of soft tannins (Gremola, 1999, Vignalta - £45). Each was good drinking. So now you too know the secret of The Thirty Nine Steps. When you arrive at the Luna Baglioni, pace them out. Then stand in awe before one of the great man-made winders of the world: Piazza San Marco in Venice. Calle larga dell’ Ascensione 1243, San Marco, Venice 30124, Italy.